I don’t like clutter in my car. So after a family trip, a penny in my cup holder stood out along with a straw wrapper. Kelly’s milkshake. I did not recognize the tail-side design. The familiar Lincoln memorial had been replaced by a thirteen stripe shield bearing “E Pluribus Unum.” Out of many, one. I think I missed the change (circa 2010) because I have gotten away from change. The two places where I used change most were the office lunch room cafeteria and the office vending machines. The former takes cash and checks, so to quit accumulating change, I went to checks using a secondary free checking account from Ally. Checks have gotten very efficient to process, getting converted quickly from paper to digital. Family checks are now deposited at the kitchen table using an iPhone or iPad. However, I doubt Ally is making much off my lunch money. The second place I used change was our office vending machines. A little over a year ago, our vending machines got cellular antennas and magnetic / RFID card readers. The prices went up to fund the change, so my number of transactions went down, but I’ve been tapping my Amex smart chip ever since. No change. These checks and these RFID card readers cost merchants money. There has been resistance in the U.S. to install new RFID equipment when “swiping” plastic works fine. What problem does tapping really solve? I think it solves the problem of card reader salesmen quotas. Enter PayPal at Home Depot. I spotted PayPal at Home Depot just last week. What do I need? My finger, my phone number, and my PayPal pin number. I don’t need anything plastic, magnetic, paper, leather, and I don’t need a phone. I don’t need batteries. My finger runs on food from the cafeteria and the vending machines. What equipment do the merchants need to install? Nothing. PayPal ties into existing PIN pads. No RFID readers, no phone readers, no squares, and no triangles. It’s low tech. It’s simple. There are a lot of companies and a lot of technologies out to transform the payment landscape: Square, Google Wallet, Apple’s iWallet, CashEdge, and even my company’s own DPXPay. But will PayPal’s simple finger, no battery, merchant-friendly approach beat them all? E Pluribus Unum? Out of many, one? Guest blogger Jeb Cashin counts pennies at Harland Clarke by day… and often at night. A note from Bob Williams – I’ve known Jeb for about 15 years and we share a common employer. He’s been a colleague, an internal customer, and my direct manager during that time. Many thanks to him for providing this thoughtful and entertaining look at the landscape of payments. How do you make Person-to-Person Payments? Back in September I tagged an article about CashEdge and their offering of P-to-P payments by using the recipients email address or phone number. Its part of the the Intelligent Money Movement platform offered by CashEdge. My first thought when I read the article was PayPal. I’ve got a PayPal account that I use for the occasional eBay transaction. I can send a P-to-P payment to any other PayPal user if I have their email address. Yet I’ve only used it for that purpose once outside of an eBay transaction. I paid a co-worker for lunch via PayPal. We had agreed on this method in advance, if for nothing else to just to go through the experience. In that space while the PayPal transaction is convenient, it does require the receiver to pay a fee for each transaction. The CashEdge product is intended to be part of your online banking experience through a financial institution. The transaction fee for this type of service is often paid by your financial institution, unless they choose to charge a fee to offset or recoup their costs. So the question I’m left with is how do consumers prefer to make person-to-person payments? Cash is always nice, if you have it. If you’re like me though, you rarely carry cash. Do you prefer to write a paper check? 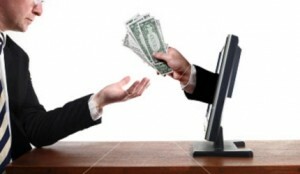 Do you think about electronic options such as PayPal or an electronic funds transfer? Is that convenient for both you and the recipient? Do you agree with this? Is it now socially acceptable to tell the baby-sitter that you’ll send them an electronic payment? Can ask little Molly for her email address so you can pay for those Girl Scout cookies?